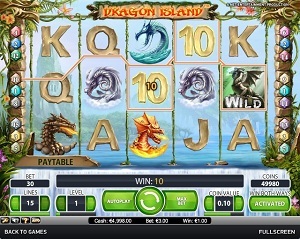 Dragon Island is a great online video slot game from Net Entertainment that has been released on July 2011. This video slot game has 5 reels and 15 pay lines. The theme of Dragon Island is inspired by the beauty and magnificence of Dragons, as well as the hidden Island where they all live. Online slot game players who love legend stories and mythical creatures such as dragons agree that playing Dragon Island is the perfect game for them. Even those who have taste for great games, graphics, sound effects and generous prizes claim that Dragon Island is an online video slot game that is worth playing! The reels display the Island of the dragons, with a realistically-looking waterfall that you see along the Spin button. This slot game can reward you with up to 50 whopping free spins + 100x multiplier when you hit 3 or more Scatter symbols! A nice thing about Net Entertainment is that they let interested players to play instantly on their slot machine games, without the need to download anything. Even if dragons do not exist in the real world, they are completely alive in our imaginations and they are marvelous monsters to portray in many fantasy-adventure movies and RPG games. Moreover, you will have a grand time playing Dragon Island as you can Win Both Ways, a Golden Wild (when the Win Both Ways feature is activated) that carries a random multiplier (from 2x up to 8x) that can significantly boost your winnings, it has a whole lot of Free Spins, the maximum jackpot in cash is $100,000, you can win up to 200,000 coins, and last but not least, it is considered to have a 96.6% payout ratio! Sophisticated graphics and awesome sounds, that’s what is Net Entertainment’s online video slots games is all about. Dragon Island has a setting of what looks like an untouched island paradise, where you can find different mystic dragons, which are described based on their designated elements (fire, water, earth, and air). The symbols are drawn artistically and professionally, and you will not grow tired of playing this online slot game as you can see great animations when you get winning combinations. The overall graphic design of Dragon Island showcases the colors blue, green, red, orange, pink, purple, yellow, orange green, and brown. The brightly-colored dragons are nicely matched by different kinds of entertaining sound effects, with the usual background sound of nature, complete with chirping birds and the sound of the waterfall that is gently flowing down your screen. When you spin the reels and manage to hit a win, you will hear varying sounds that you usually hear in suspense adventure shows, which is actually suitable for this theme. Of course, you would be shocked too if you happen to encounter a real live dragon, wouldn’t you? The regular symbols are the card deck symbols which are 10, J, Q, K and Ace; and the other symbols are brightly-colored legendary dragons such as the red/orange Volcano Dragon, brown Stone Dragon, green Swamp Dragon, blue Sea Dragon, and the purple Mountain Dragon. The Wild Symbol is the Dragon Statue. The Dragon Statue acts as a substitute for all other symbols, with the exception of the scatter symbol. When the Win Both Ways is activated, the Golden Dragon Wild Symbol appears and can increase your wins for up to 8x! Just by activating the Win Both Ways feature of Dragon Island and you receive 5 symbols in a row, you automatically double your current bet and you play for a payout of 2x. The Win Both Ways feature gives you the possibility of winning on symbol combinations from both right to left (reels 5 to 1) and left to right (reels 1 to 5) in consecutive order. Please take note that the Golden Dragon Wild Symbol only appears on reel 3. The Scatter Symbol is the Volcano. If you hit 3 or more of this scatter symbol, you will activate the Free Spin bonus feature game where you can win up to 50 free spins + a 100x multiplier! In Dragon Island’s Free Spin Bonus Feature game, when you manage to hit 3, 4, or 5 scattered Volcano Scatter symbols (that appear anywhere on the 5 reels), you will activate the Free Spin Bonus Feature game and you can win 10 Free Spins with a bet multiplier of 3x, 20 Free Spins with a bet multiplier of 10x, or 50 Free Spins with a bet multiplier of 100x! What’s more exciting is while you are playing the Free Spin Bonus Feature game and you get another 3 or more Volcano Scatter symbols, you are awarded another 10, 20, or up to 50 Free Spins! The extra Free Spins are added to your remaining number of Free Spins. You can win an infinite number of additional Free Spins during the Dragon Island Free Spin Bonus Feature game. When the Dragon Island Free Spin Bonus Feature game is over, you are then returned to the regular Dragon Island slot game and your Free Spin wins are added to your win total. Note: During the Free Spin Bonus Feature game, an Expanded Dragon Wild Symbol will appear on a random reel before each spin. Dragon Island has 5 reels where you may bet on 15 pay lines. The minimum bet is 0.01 coins and the maximum bet is 0.50 coins per line. It’s more fun and entertaining to play online video slot machine games when there’s an Autoplay function. Dragon Island can be played automatically by just activating the Autoplay function located on the lower leftmost part of the screen, or just beside the Spin button (on the left). You can even customize your Autoplay with their Advanced Settings menu. You can start Autoplay and “Stop” whenever: you manage to hit a win, you won Free Spins, your single win exceeds a specified amount, or your cash increased/decreased a specified amount. Once you are completely satisfied on your Autoplay settings, simply click on the Start button and the slot machine game will play automatically for you.